an epic fail. You are forgiven for wondering what the heck is that? Not a tea cosy, no no my friends I started this project with every intention of having a bi-colour (not tri-colour) slouchy hat. I tried to scale up a baby hat pattern, but err I think I made a miscalculation. Does my head look good in this?? I may have bitten off more than I could chew. But that's me - always the optimist. On the upside I tackled stranded knitting technique and working in the round with four needles. I don't like the four needle thing and I'm thinking this is why I have a little nubby bit on top. Maybe that would block out - maybe not. I showed this to a friend who rather appropriately set her face to horrified and helpfully suggested it might fit her 30 cup teapot - ahhh if only I had bound off an opening for the spout. Okay - that's enough self-deprecation...I have a point. While I was thinking over writing this post I started giggling to myself about the monstrosity it became. The funniest thing is I actually finished it! My husband stopped looking at TV to stare at me quizzically. I felt quite buoyant all of a sudden. 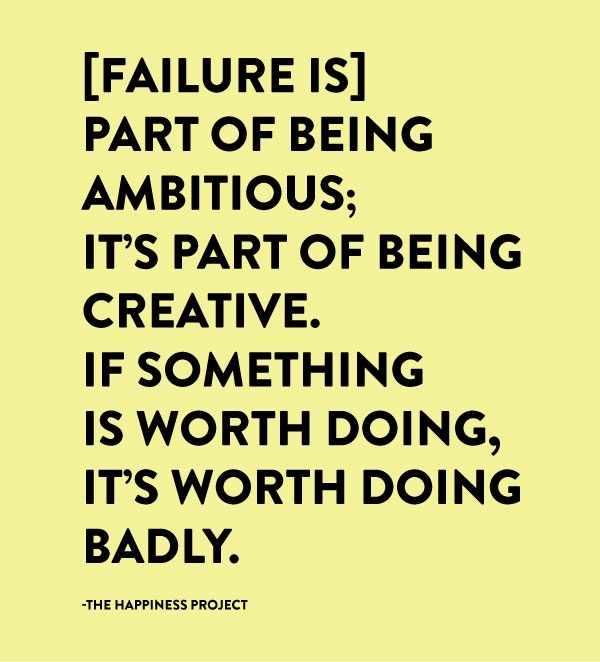 Laughing about it made me realise that this is what being creative is all about - embracing the unknown and not letting the possibility of a fail stand in the way of giving it a go. In fact if you indulge your creativity often enough then statistically speaking you are going to fail - many, many times. I don't knowingly let anxiety about perfection/making a mistake or apparently 'wasting' time or resources stand in the way of trying something new but maybe there is a bit of that going on. In any case this is a lesson I can apply to all sorts of areas in my life. Now when I attempt this hat again I will know exactly what not to do and maybe I'll end up with the slouchy bi-colour hat of my dreams. lol... I agree with CHD, it is gorgeous regardless of it not fitting. Such a pretty pattern and colours. It's lovely, shame it doesn't fit. Good that you can laugh about it, I think that's something that I need to work on. I bet there's someone out there somewhere with a huge headfull of dreadlocks who can never find a hat to fit...now you just have to find that person! Seriously... I laughed and laughed at the second photo. not at you but with you :) Such a pretty pattern... where would we be without "failures?" i like to call it Learning rather than failing :P i know, issues right? Thanks for this - so refreshing and fantastic! perfect for a bad face day (so much worse than a bad hair day). It is a lovely thing, if a bit on the large side. however i have a husband who just hot washed half my dark clothes whilst i was sick and shrunk heaps, who could work a bit of magic on it for you!